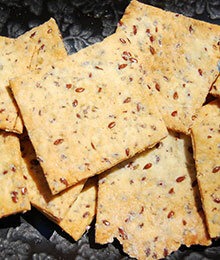 Soak flax seeds for 4 to 6 hours in purified water. You will then have a gelatinous mixture, be sure to keep moist and loose for spreading. Add Braggs and lemon juice to taste and mix well. Spread mixture as thin as possible on your dehydrator trays with a teflex sheet on top. Keep your hands wet as this will help on spreading the flax seeds (or use a spatula) Dehydrate at 105 degrees for 5-6 hours and then flip the mixture and remove the teflex sheet. Continue dehydrating until the mixture completely dry. Approximately 5-6 more hours. Or “bake” at 120 degrees for 6-8 hours, and flip for a couple more till dry. Optional: Add garlic, onions, carrot juice, taco seasoning, Italian seasoning, chili powder, cumin in any combination. Be creative!